Travel to Dublin without leaving Philly! 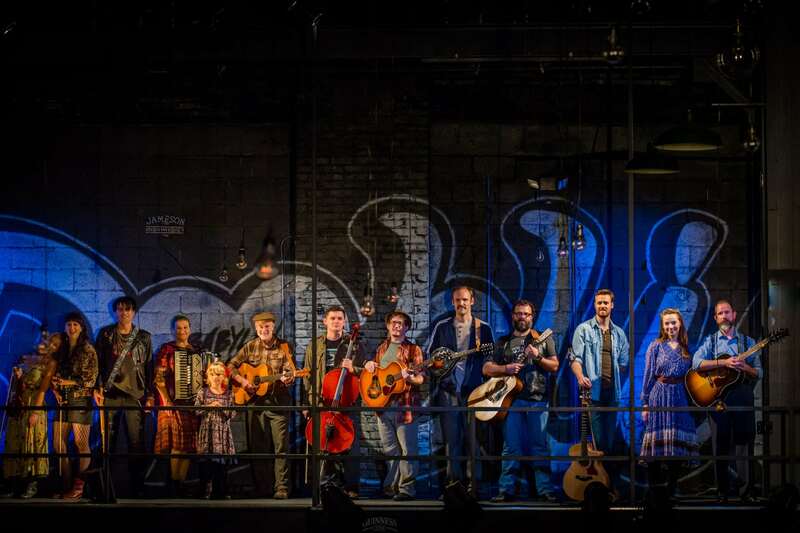 If you’ve ever wanted to visit Dublin but don’t have the airfare, well book your tickets to Once at The Arden Theatre Co in Old City. Known for their exquisitely “simple” sets, innovative staging, and Broadway caliber talent, Arden’s Once takes you on an intimate journey between a “Guy” and a “Girl”. With a book by Enda Walsh, Once is a story of Guy, a vagabond musician in Dublin, who helps his father run a vacuum repair shop by day and plays music at a local pub at night. His songwriting is of a cheating lover who moves across the pond to NYC. He decides to abandon his music and his love until a Czech Girl walks into the bar and manipulates him into pursuing his passion of music and to believe in love. It’s a transcending love story that will leave you gasping as each layer unfolds and in its resolve. No doubt influenced by the original Tony Award winning Broadway musical, Director Terrence J. Nolan and Scenic Designer David P. Gordon upped the ante from the original proscenium staging to a gorgeous in the round venue. Not only in the playing space in front of you, it’s also behind you, across from you, and next to you. With run down oriental rugs carpeting the floor, elevating dangling lights from above, neon signs promoting Irish beer brands, posters, spray paint tags, old relics, etc. adorn every wall in the entire house of the theatre. Each audience member is greeted upon entry with pre-show entertainment featuring popular crossover hits (like an MTV Unplugged jam session) from a majority of the cast who each play at least one musical instrument. The cast and orchestra are intertwined as an impeccable ensemble. Here, there are no triple-threats, they’re quadruple threats. With a show time of 7pm, it’s wasn’t until 7:25 when the actual scripted performance began. Unsure if this is a standard start or to chalk it up to holding the curtain on opening night due to the early show time and getting the audience in their seats. The fortunate part of the pre-show is that you know when they begin a song you have time to grab a nice beverage at the bar. In this setting, how can you not want a drink? At intermission, they open a bar right on stage for patrons, including $3 Jameson shots! Music Director Ryan Touhey not only guided the remarkable vocals but also the musicians. The way that each artist handled their instruments with ease, made me believe that I too could strum my way into the chorus. Not only do they sing while playing, they also MOVE. Steve Pacek’s delightful choreography and staging take the musicality of the score as written by Glen Hansard and Marketa Irglova and brings it through the body. The musically charged scene changes were also expertly executed in time with lighting as designed by Thom Weaver. As the ensemble so masterfully aids the story, the heart belongs to Guy (Ken Allen Neely) and Girl (Katherine Fried). Both Neely and Fried make their Arden debuts. What a breath of fresh air to be introduced to new talent. Although Neely’s performance as Guy fit the image although pitchy at times, it was Fried’s interpretation of Girl that left me transfixed. She is one of those actresses you are introduced to and say to yourself: “Where did she come from?” Her precious voice, the ease of her piano skills, the intimacy of her listening, just breathtaking. I would remark an uncertainty of her costume as she was dressed like a peasant girl. As were other members of her stage family. It was an interesting choice, and one that left me confused as this is a modern tale. Although the music is mesmerizing, the book is a bit sparse and the lyrics lack substance which makes this 2:15 minute production about 30 minutes too long. With that aside, there are so many wonderful entities to this production as noted. If I can impart one thing, it’s to see Katherine Fried glow in person before she leaves town. The cast/musicians include some new talent as well as being chock full of “Philebrities”: Scott Greer, Greg Wood, Emily Mikesell, Kendal Hartse, Mary Fishburne, Alex Bechtel, Skip Robinson, Justin Yoder, Charlie DelMarcelle, Josh Totora, and the sweetest sweetie pie, Lucia Brady. Single ticket prices start at $37 with discounts available for groups of 15 or more, seniors, students, military, and educators. Call the Arden Box Office at 215.922.1122, visit www.ardentheatre.org or visit the box office at 40 N. 2nd Street in Old City, Philadelphia. Once has been extended through October 28th due to its pre-opening buzz.